300cubits, a blockchain-powered ecosystem to secure shipment booking is set to launch their ICO on 12thApril, 2018. This month long campaign will offer 18,000,000 TEU tokens—the proprietary medium of transaction on the 300cubits platform. TEU tokens have been rated 4.6 out of 5 from ICObench. The 300cubits team and its advisory group comprise of renowned industry veterans, usually unseen in most of the ICOs. One of the Co-Founders, Johnson Leung, has twenty years of relevant industry experience; particularly in the shipment booking process. The advisory board has Thomas Eskesen and John Urban, two noted experts that have founded INTTRA and GT Nexus, portals like booking.com for booking ideal accommodation. Around 30% of the global shipment bookings go through these two portals. The team is also pleased to have Charlie Wellins, a highly respected C-level executive in the container shipping industry and Hua Joo Tan, a KOL / influencer where his weekly newsletter was read by thousands of key industry professionals. Following a successful trial shipment, 300cubits is pleased to announce that their ICO public sale will start on April 12, 2018. Meanwhile, the company also informs that the ongoing private placement for contribution at or above 20ETH will continue until April 12, 2018. The upcoming ICO will continue for a month, during which the early adopters to this blockchain-based container shipping platform will gain access to 18,000,000 of a total supply of 100,000,000 TEU tokens. 2% of the TEU tokens have already been successfully sold for 1588 ethers, while the team is selling another 18mn TEU tokens in the Private Placement and ICO. 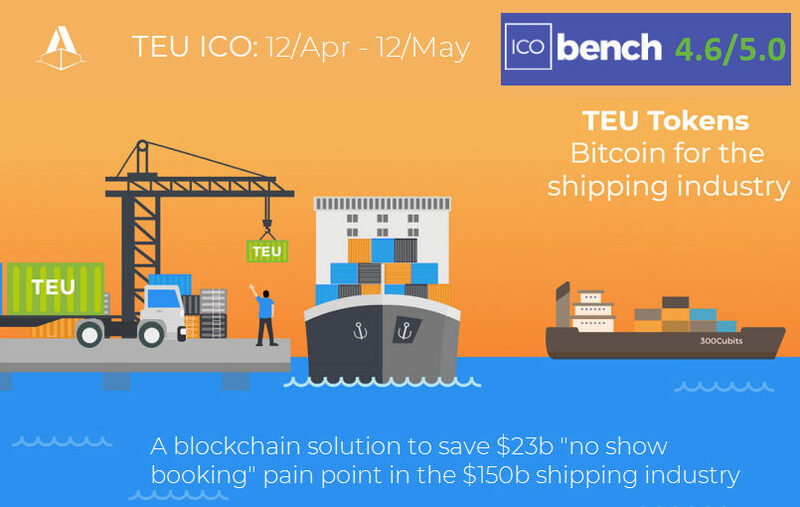 300cubits’ TEU tokens and ecosystem are designed to tackle the $23bn “No Show” pain point in the container shipping industry. The container liners have been incurring chronic losses over the past decade, which has led to some of the largest bankruptcies the industry has witnessed. 300cubits strongly believes that this sorry state of the industry is due to its inability to execute agreements in its daily operations. “No Show” is a glaring problem faced by the industry, and it refers to a situation where a customer books a shipping slot but does not turn up with the cargo. Plagued by a “No Show” probability of around 30%, the industry has long been trying to implement booking deposits. However, the customers have vehemently resisted the idea of placing their cash up front. On the other hand, the crypto world wants a token that is accepted by the real world. The 300cubits team is looking to connect the two worlds by offering some tokens to the industry for free, on the condition that the industry will use these tokens to ensure wide acceptance of TEU tokens in the shipping industry. 300cubits is confident about eliminating the shortcomings of the container shipping industry by issuing ERC20 compliant TEU tokens in the Ethereum network, and promoting them as the cryptocurrency for the container shipping industry. The smart contracts governing the transactions of the TEU tokens are coded with a set of immutable conditions, and neither of the parties will be able to alter what has been agreed upon. The TEU tokens have already received the rating of 4.6 out of 5 from ICObench, a popular rating platform and a blockchain community supported by a wide range of experts. The production system of the project is expected to go live on June 15, 2018. A system prototype has been successfully tested by most of the major industry participants, while over eighty shippers have already signed up to use the TEU tokens. The first live trial on two 40-feet high cube containers out of Malaysia has been successfully completed with the participation from a major container liner, Malaysia’s West Port and LPR, a large Brazilian textile importer. About the Company: 300cubits provides a blockchain solution, tackling industry pain points such as “No Show” by creating TEU tokens, a digital currency, as booking deposit and an ecosystem to facilitate the use of the digital currency. To participate in 300cubits’ ICO, please sign up for the waitlist here or join the company’s telegram group here. Next Next post: How Blockchain can Solve Problems for Online Gambling Sites?